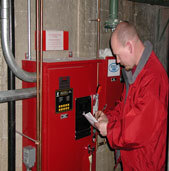 Fire Systems Professionals is a local company focused on solving our customer's problems. Whether it's a remodel, an upgrade or an emergency repair FSP service starts with paying attention to what you need to keep your property safe and code compliant. Located in Grove City, Ohio our size and attentive staff ensures personalized attention to your problems. We do it right the first time, and work to minimize our customer's costs, particularly in the long term. Whether you want a fire alarm, extinguisher inspections, a range hood, a sprinkler remodel or a data network installed, we work to get it done right for you; On time and on budget. FSP doesn't want to become the biggest company in town, but rather the best, through consistent attention to customer service and quality workmanship.